Wow. I can’t believe that it is already Sunday night. Time really does fly. It seems like I just did my menu plan for last week. This week is going to be crazy, just as last week was. I have so much going on. I didn’t get half of what I wanted to get baked last week done, so I have moved some of it to this week. I am trying to concentrate on using stuff I have in the house and only buying fresh fruits, milk, eggs & veggies. Well, the $100 I spent at the grocery store today shows that I didn’t do as well as I had hoped! LOL! I really should stay out of the store when I am hungry. Sunday ~ Grilled Salmon, okra medley (for me; brocooli for my peeps), steamed brown basmati rice and spinach salad. Oh, the kids also had leftover All Purpose Quick Bread. Monday ~ Crockpot Roast Chicken, garlic mashed potatoes, steamed green beans & salad. 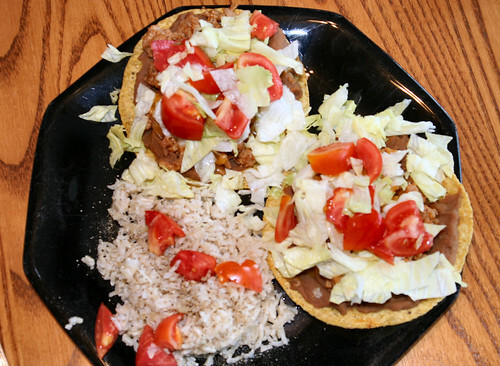 Tuesday ~ Mexican Pizzas with ground turkey taco meat, mexican rice, & salad. Wednesday ~ Cheeseburger In Paradise. Hannah has ice skating. Saturday ~ Breakfast for dinner (french toast for the kids), veggie frittata for moi, bacon & sweet potato hash browns. Mexican Pizzas are a quick go-to dinner for me. I end up making these on nights when we have lots going on…meetings at school, hockey practice, swimming lessons, etc. I can get these ready in a matter of 30 minutes or less (not counting the rice, you can make this earlier and reheat). I usually prefer to use ground turkey for the meat, but occasionally will use ground beef if the ground turkey isn’t on sale. The rice is based on a recipe that my Mom used to make when I was a child. I have modified it a bit for us b/c my stomach can’t tolerate onions. 2. Chop tomato, peel garlic, chop onion and place all ingredients in a food processor/blender. Puree until everything is liquid. Add cumin (about 1 tsp), chili powder (1/2 – 1 tsp), red hot (I like a lot, but use your own judgement), S & P. Blend. 3. Place EVOO and rice in a 2 qt. sauce pan and warm over med to med-high heat. Brown rice, but don’t burn it. 4. Dump tomato mixture into a glass measuring cup and then add chicken broth to equal 2 cups of liquid. Dump your 2 cups of liquid into the rice; stir and bring to a boil. 5. Stir and reduce heat to simmer for 40-50 minutes, depending on what kind of rice you are using. 6. Remove from heat and let stand for 10 minutes. Fluff with a fork & serve. You can either now serve this or put away in the fridge and then reheat for dinner. 1. Brown ground meat in a pan. Add taco seasoning. 3. Warm beans in a pan on the stove or in micro. 4. 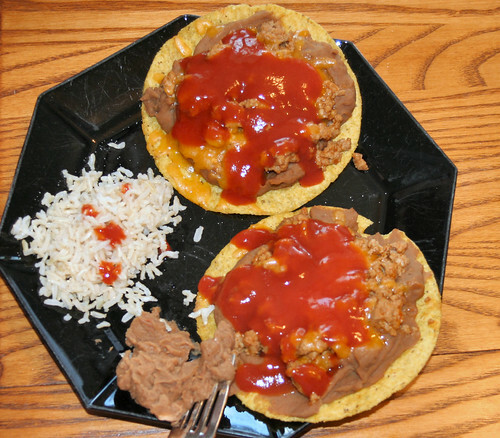 Heat tostadas on a cookie sheet in the oven for 3-5 minutes or until hot. 5. Top shells with beans, meat & cheese. 6. Return to oven until cheese is all melted and bubbly. 7. Top with favorite toppings and serve! This is one of the kids favorite meals and is super easy to make.